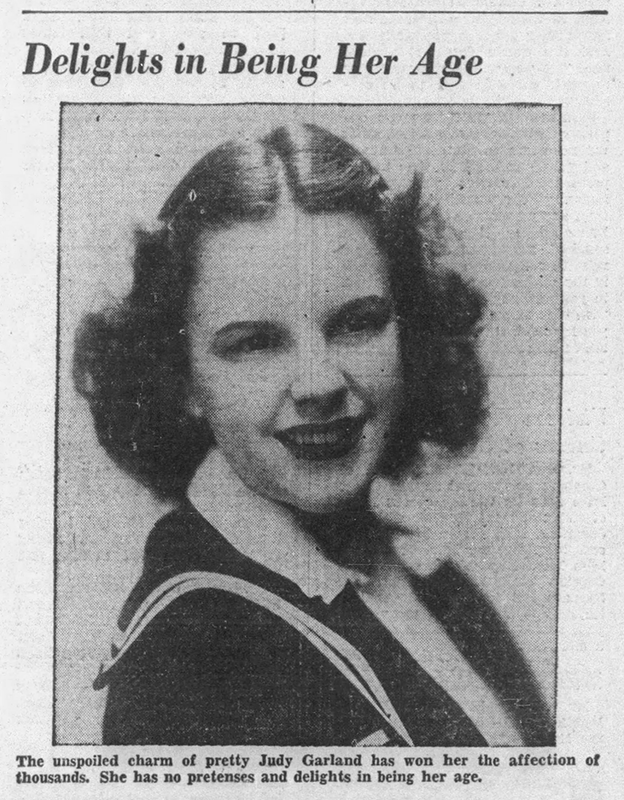 August 7, 1938: Judy has designs to be a lawyer! 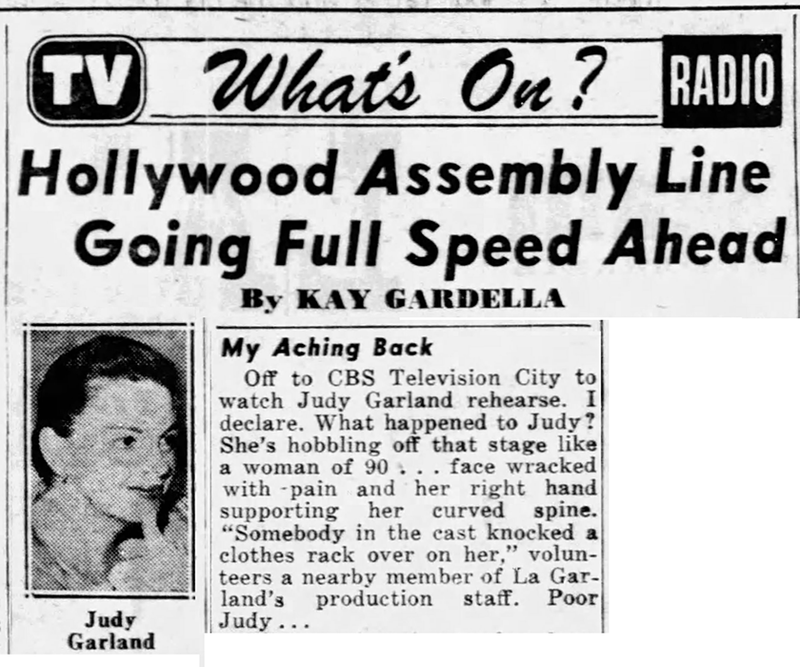 This article no doubt was part of MGM’s star build up for Judy and her role in Love Finds Andy Hardy. 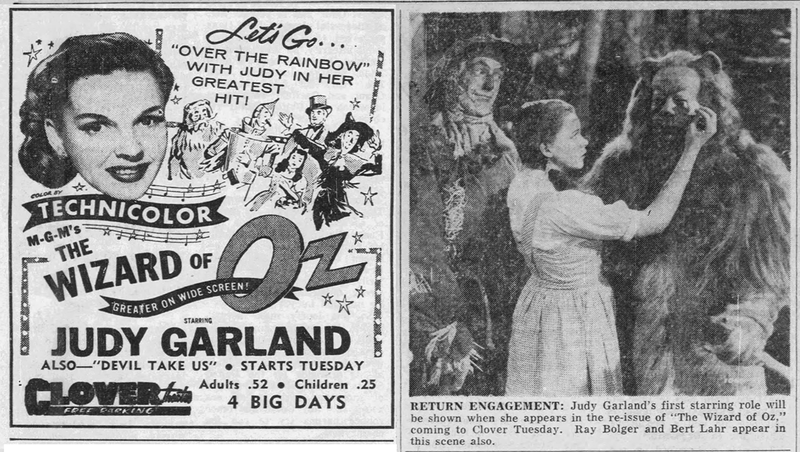 It should be noted that in almost all of the newspapers ads and photos published at this time, Judy is front and center with “Andy Hardy” Mickey Rooney even though she’s a guest star. The studio knew that they had a goldmine with the two stars. 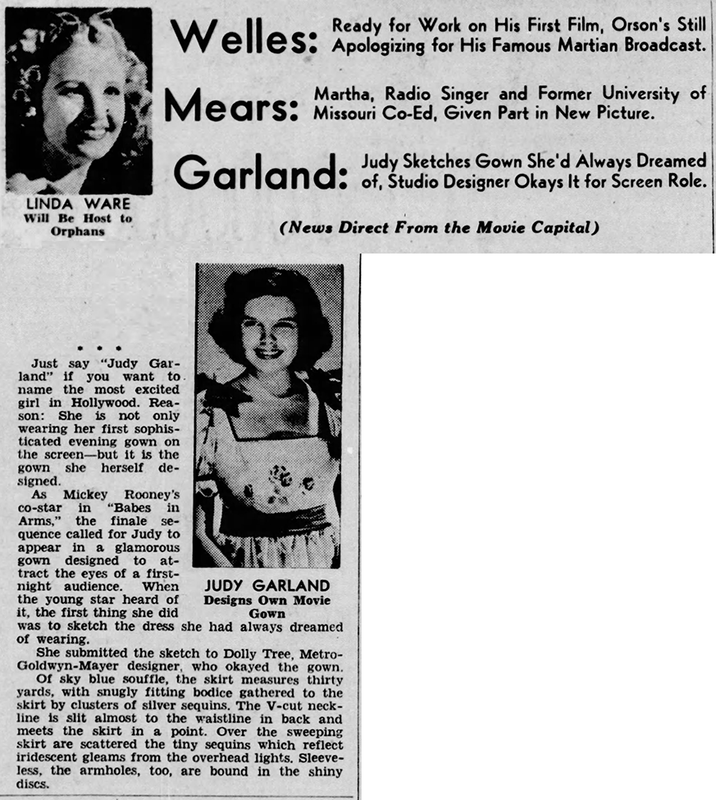 August 7, 1939: Judy designs her own gowns! 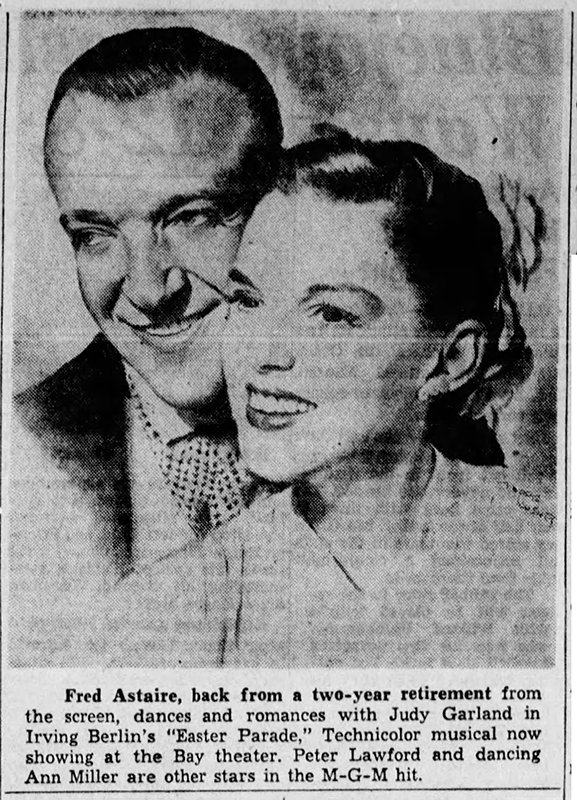 Plus Judy and Mickey were set to appear for one night only in Hartford, Connecticut. 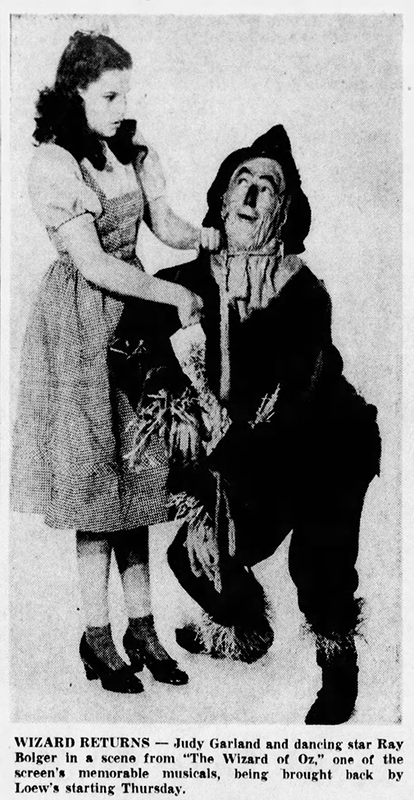 Below, more Wizard of Oz ads. 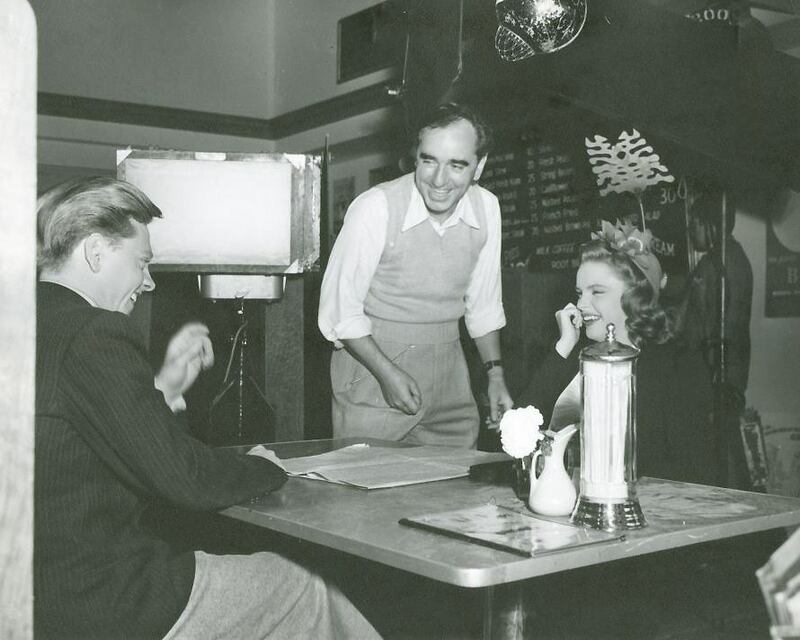 August 7, 1941: Babes On Broadway filming continued with scenes on the “Interior Pitt-Astor” set. Time called: 9 a.m. 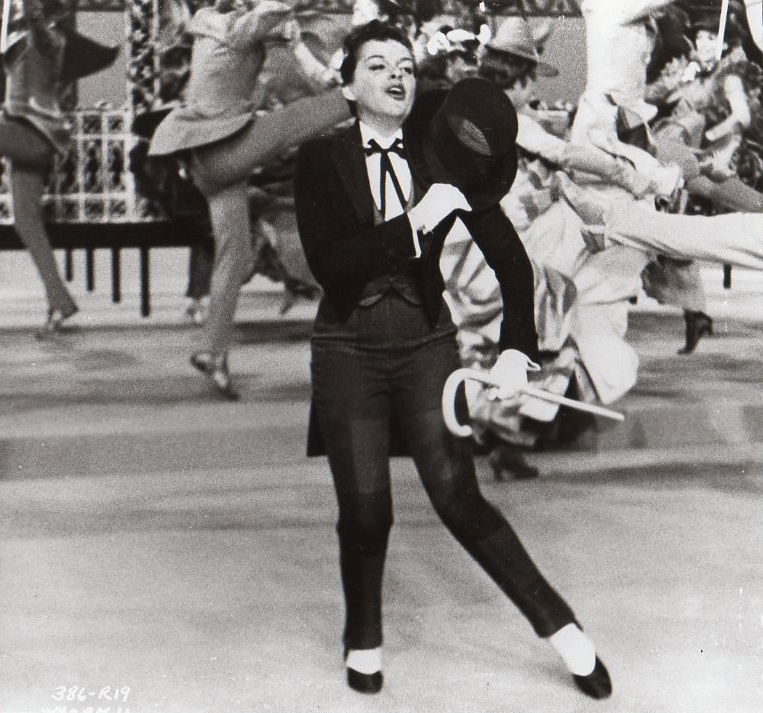 The assistant director’s reports note: 10:02-10:38 – Judy Garland taking time to get in mood for scene. Necessary to cry in scene. Lunch: 12:15-1:15 p.m.; time dismissed: 5:50 p.m.
Photo: Director Busby Berkeley jokes with Mickey Rooney and Judy between takes. August 7, 1944: The Clock filming consisted of scenes shot on the “Exterior Station”; “Exterior Tony’s Shop”; and “Exterior Top of Bus” sets. Time called: 10 a.m.; time dismissed: 6:50 p.m.
At this point, Fred Zimmerman was still the director. Vincente Minnelli wouldn’t take over the direction of the film until September 1st. 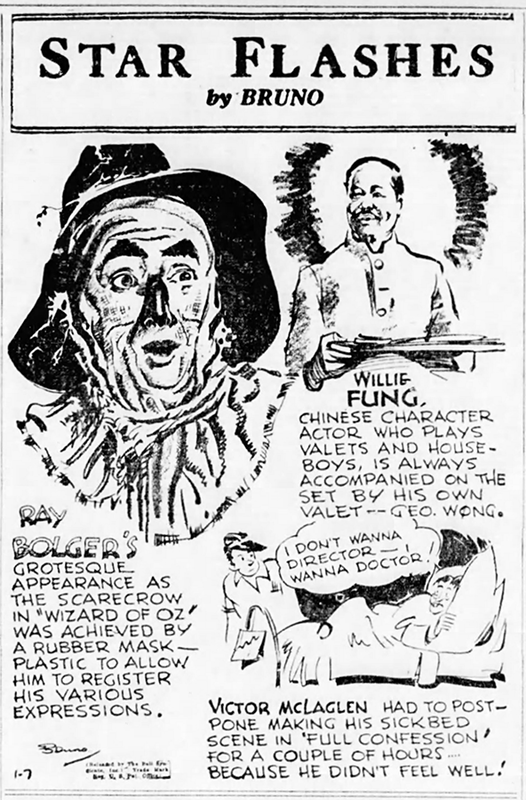 August 7, 1948: This fun promotion for The Pirate featured the story of the film, more or less. 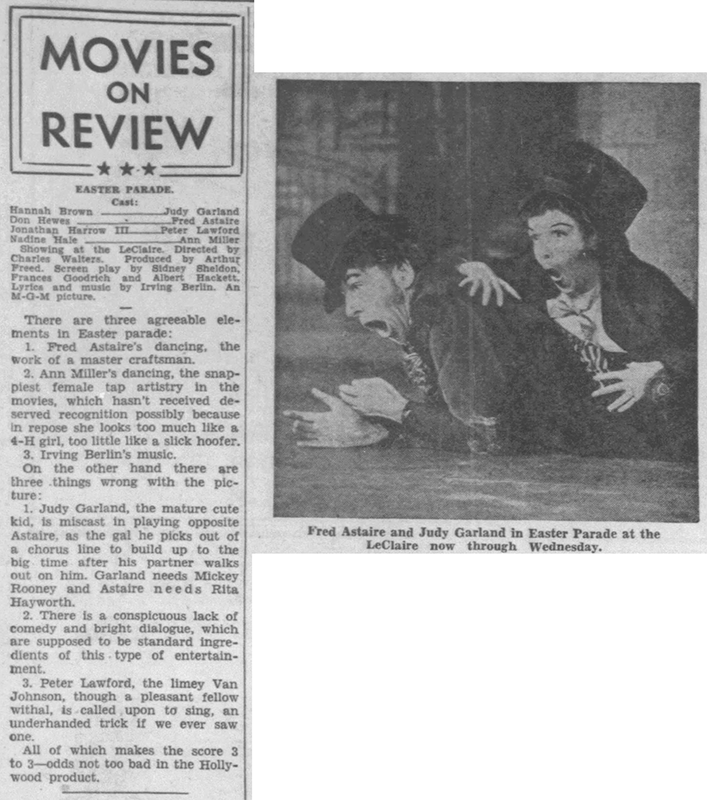 Current version of the stage play, “The Pirate,” in which Alfred Lunt and Lynn Fontanne starred originally, is a technicolor musical from MGM, starring Judy Garland and Gene Kelly. It is a gay comedy set in a mythical Caribbean island about 100 years ago. 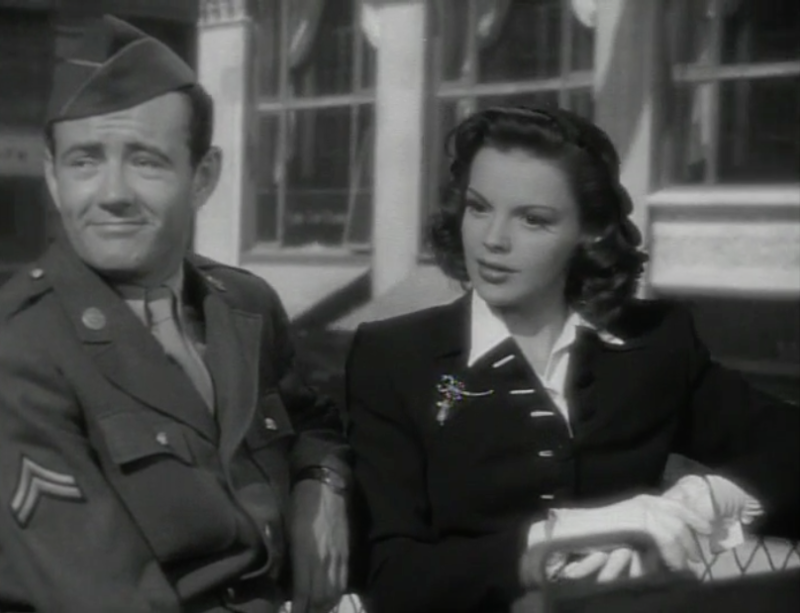 Music for the film was written by Cole Porter, and the director was Vincente Minnelli, husband of Judy Garland. Nearly 1000 extras were used for one sequence set on a waterfront. 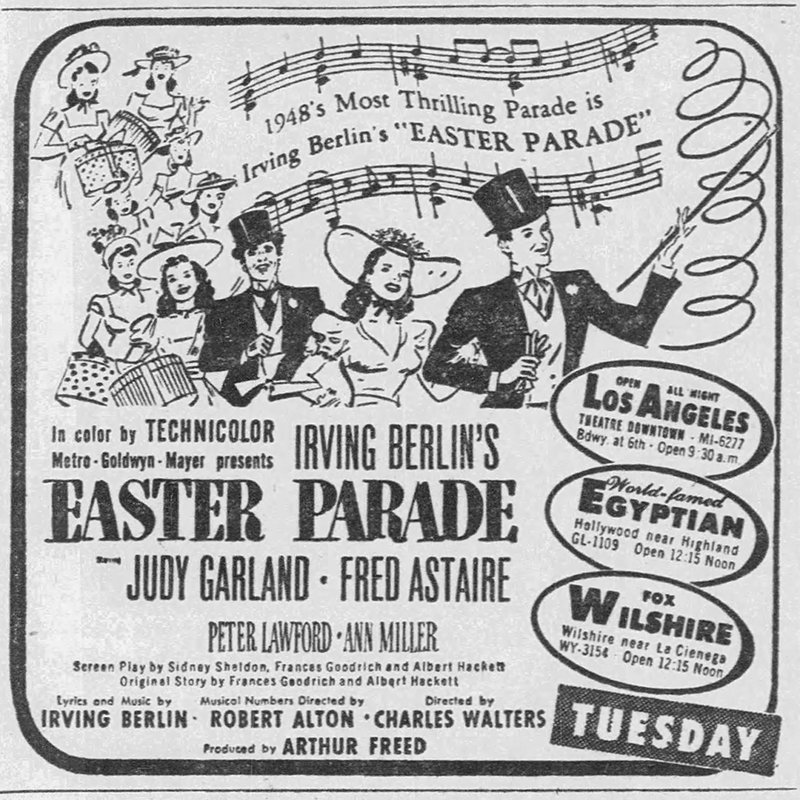 Also on August 7, 1948: This critic (article at far left above) did not care for Judy’s presence in Easter Parade, referring to her as “miscast.” He (or she) also notes that “there is a conspicuous lack of comedy and bright dialogue” as well as referring to Peter Lawford as “the limey Van Johnson.” Even the great Judy Garland couldn’t make everyone happy! 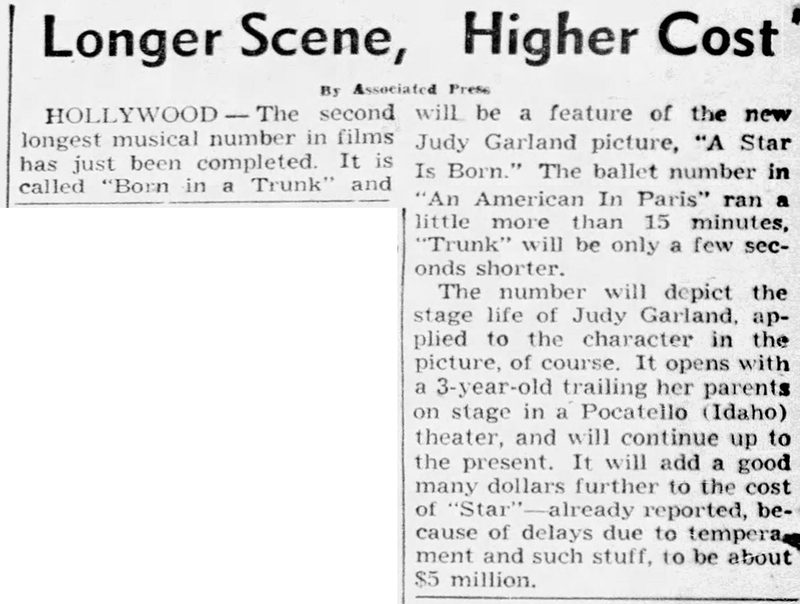 August 7, 1954: Here’s an article about the recent completion of “the production number to end all production numbers,” the “Born In A Trunk” sequence from A Star Is Born. 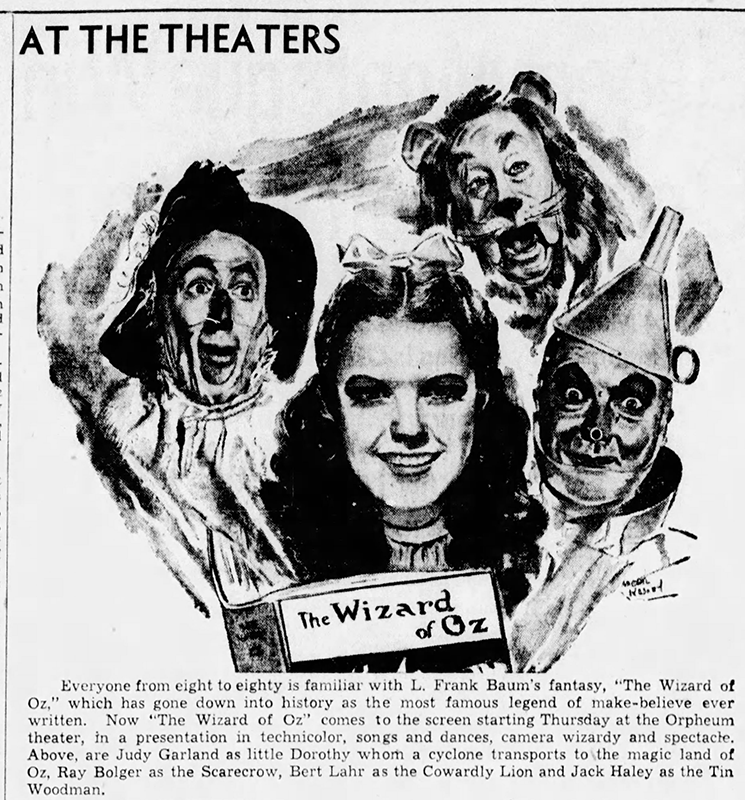 BACK PATTING: Some years ago I picked “The Wizard Of Oz,” starring Judy Garland, Ray Bolger, Bert Lahr as an all-time dilly. Got the big laugh from some film exchange friends because the first box office returns weren’t too hot. It had a big revival a couple of years ago. It comes back again this week to the Grand. It’s still a dreamboat, worth more than one look. Happy to give such a worthwhile number an advance plug. 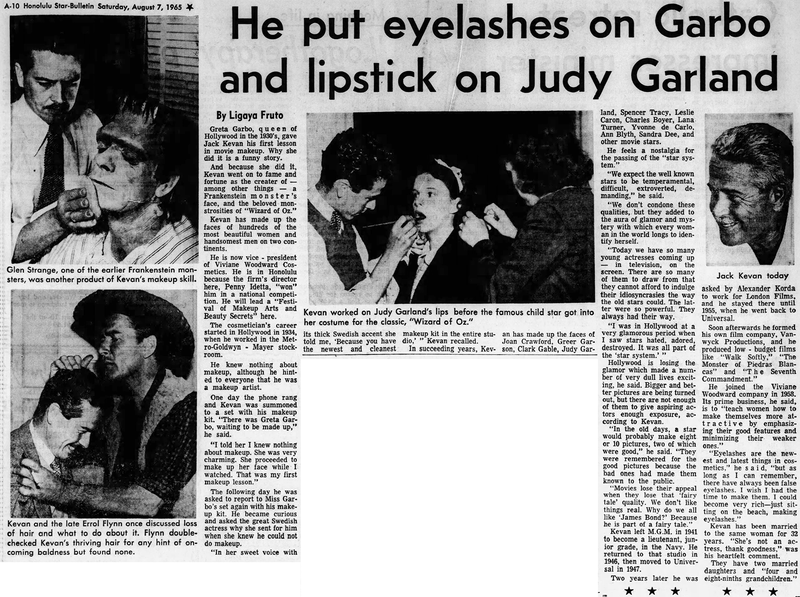 August 7, 1958: Did Judy “dis” Liberace? According to Mike Connolly’s column, she did while with her musical mentor Roger Edens, watching Liberace perform at The Coconut Grove. 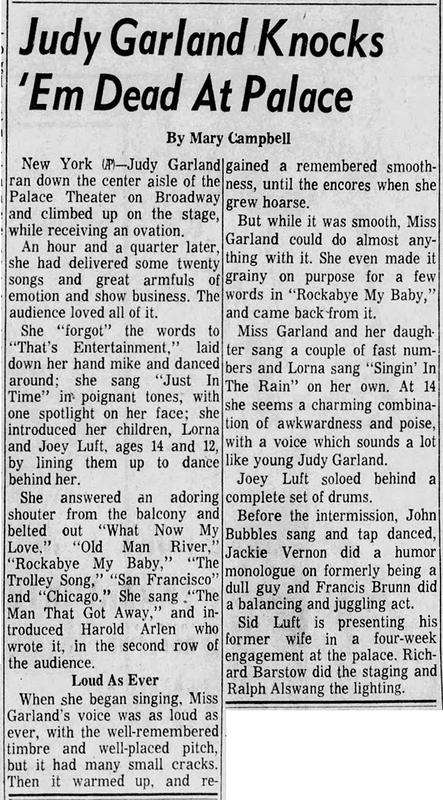 Judy had just given her last performance of a two-week run at The Grove on August 5th. 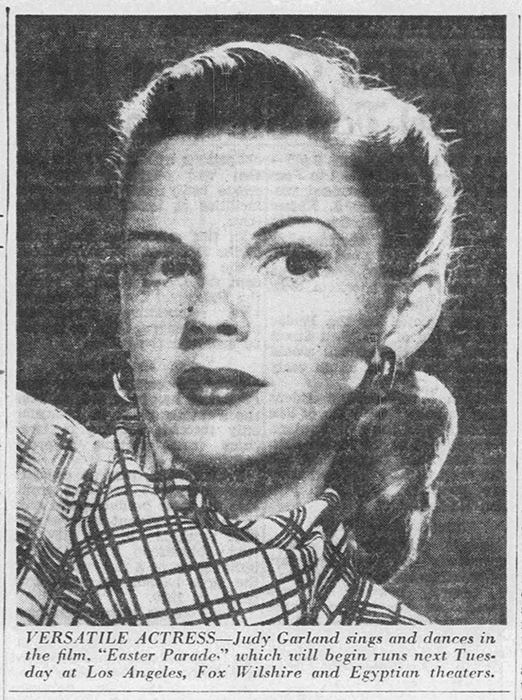 August 7, 1963: While working on her new TV series, “The Judy Garland Show,” it was reported that Judy hurt her back. 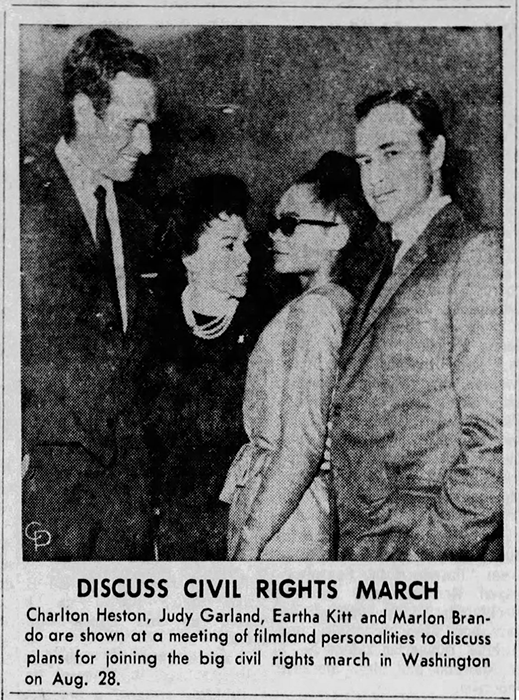 Luckily it wasn’t serious because she found time to meet with other celebrities concerning civil rights (see below). 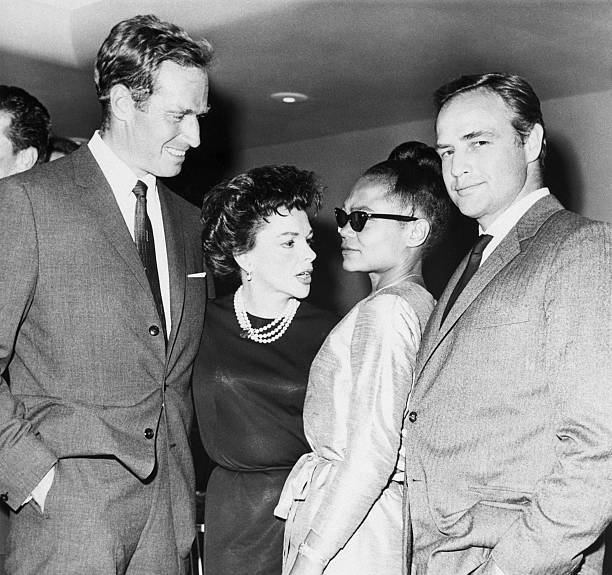 August 7, 1963: Judy joined forces with other stars such as Charleton Heston, Ertha Kitt, and Marlon Brando to fight for civil rights. 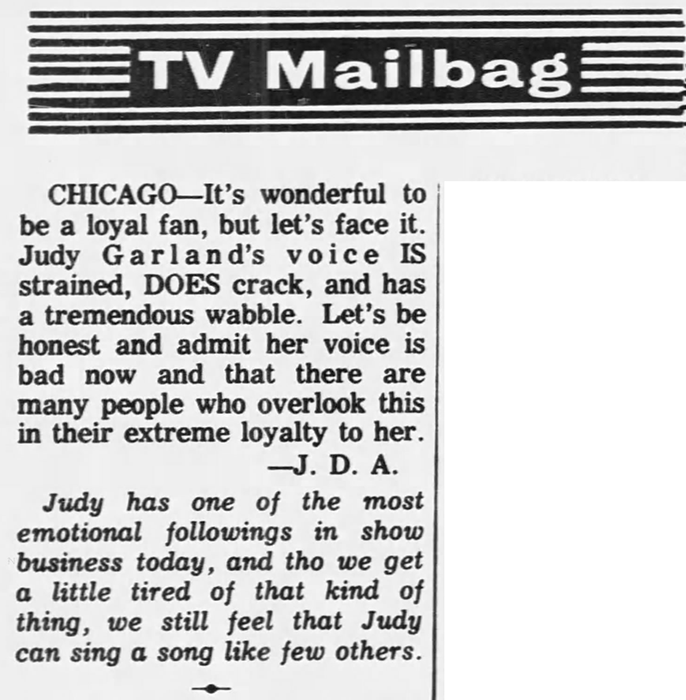 They and other celebrities had a meeting in Hollywood regarding the attending of the upcoming civil rights march in Washington, D.C. Also, this Q&A column from the Chicago Tribune notes the “emotional following” by Judy’s fans. 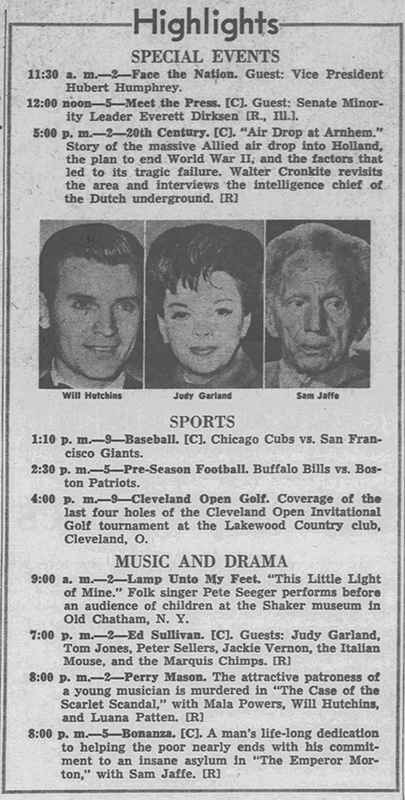 August 7, 1964: More legal woes for Judy. 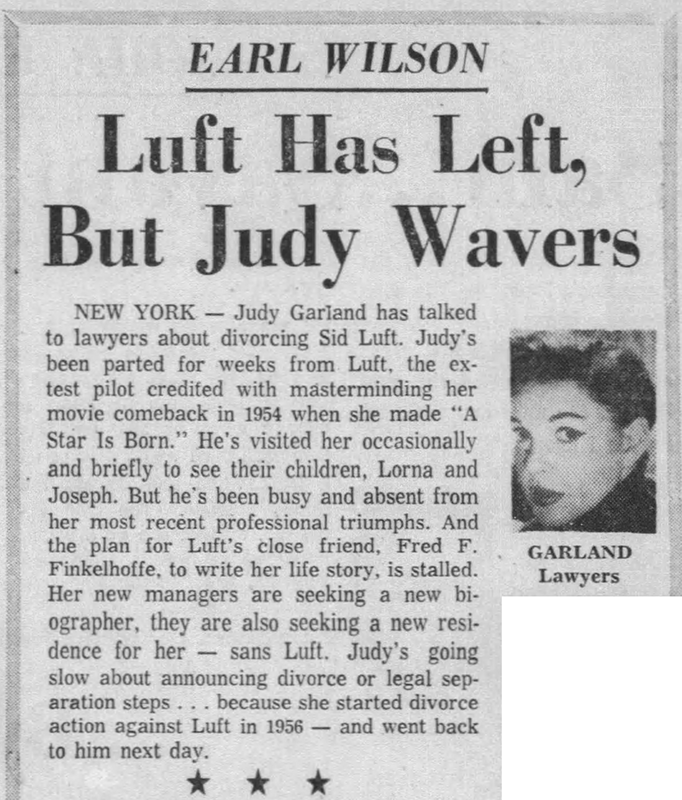 Estranged husband Sid Luft filed a petition with the courts to keep Judy from trying “to take their children ‘surreptitiously from the jurisdiction of the United States.” Judy and boyfriend Mark Herron were currently in London. 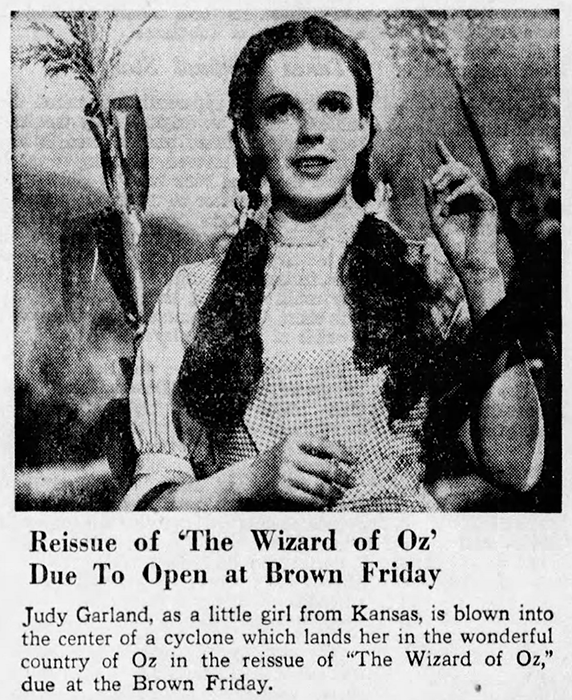 August 7, 1965: Here’s an article about MGM makeup artist Jack Kevan, who worked on some of Judy’s film including The Wizard of Oz. 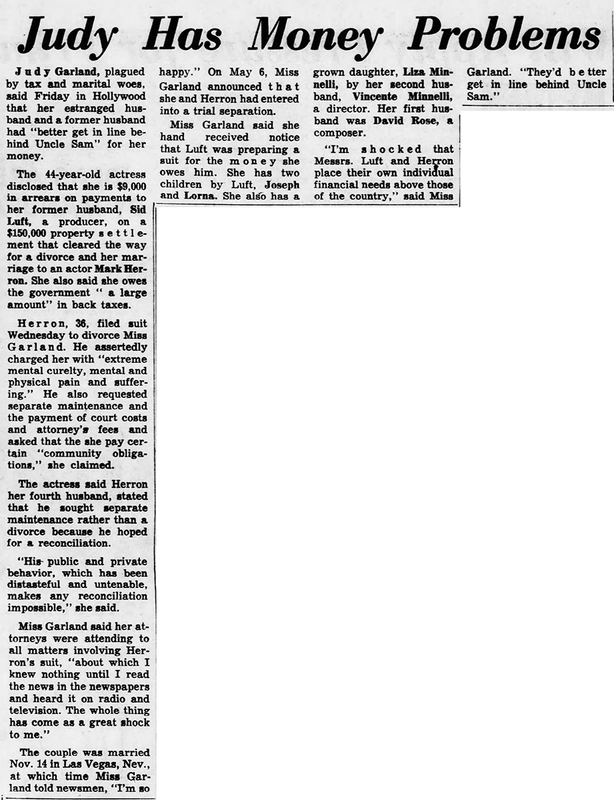 August 7, 1966: More details about Judy’s money and marital woes. 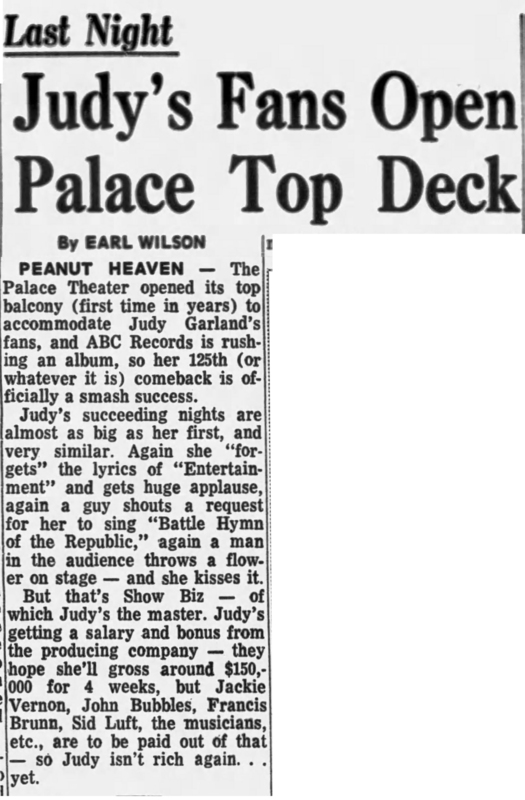 August 7, 1967: More from Judy’s engagement at The Palace. According to the news reports, the theater opened up the balcony for the first time in years to accommodate the fans as wells as ABC Records who was recording the concerts for release on an LP. 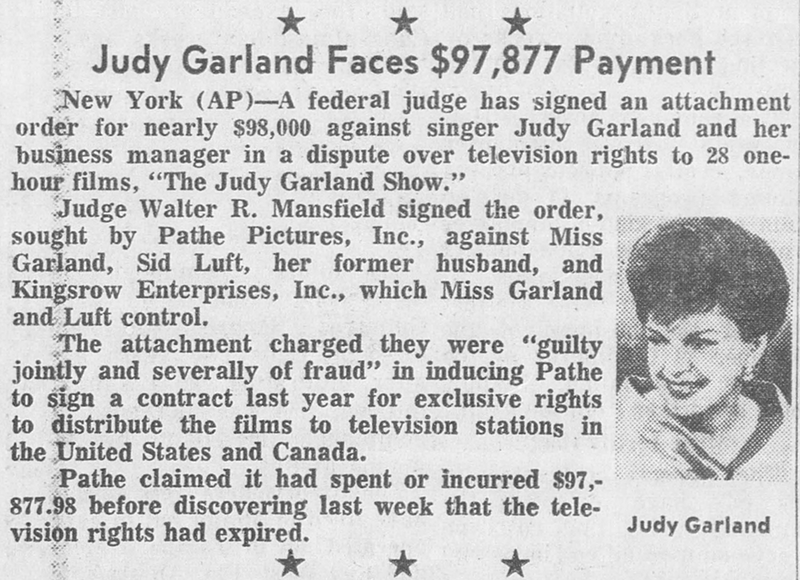 Also reported was some legal trouble for Judy and Sid regarding the rights to the 1963/64 TV series, “The Judy Garland Show.” The rights to the series remained convoluted and confusing for decades to come. Pioneer obtained the rights to restore them onto DVD in the late 1990s (resulting in two fabulous boxed sets) but now the rights have again become convoluted and confusing again. Re: The Judy Garland Show: I purchased the Pioneer “Trunk” sets for several thousand back in ’06. They are double-sided discs, and you can be certain I wash my hands thoroughly before playing a disc. They are the most precious Garland DVDS I own, as they are so rare. A lot of money, but boy, was it WORTH it. I was lucky enough to get both boxed sets when they came out. The late Scott Schechter gave me an extra copy of one of them, which I eventually sold on eBay, but not for the crazy amounts I see them being sold at. I couldn’t charge anyone that much! They’re such gold, aren’t they? I wish they would get a true HD upgrade onto Blu-ray disc or HD digital download. That would be wonderful. I know this is your gorgeous site, and NOT a “discussion board”, but I couldn’t help but reply. From everyone in the business I’ve spoken to, the current image is probably the best possible, as “Blu Ray”, or “HD”, is culled from FILM or digital. Old video tape masters have no “negative”, so the (terrific) image we have now (I was STUNNED when I first saw these in ’99) are, I believe, the best we can see. But who’s complaining? 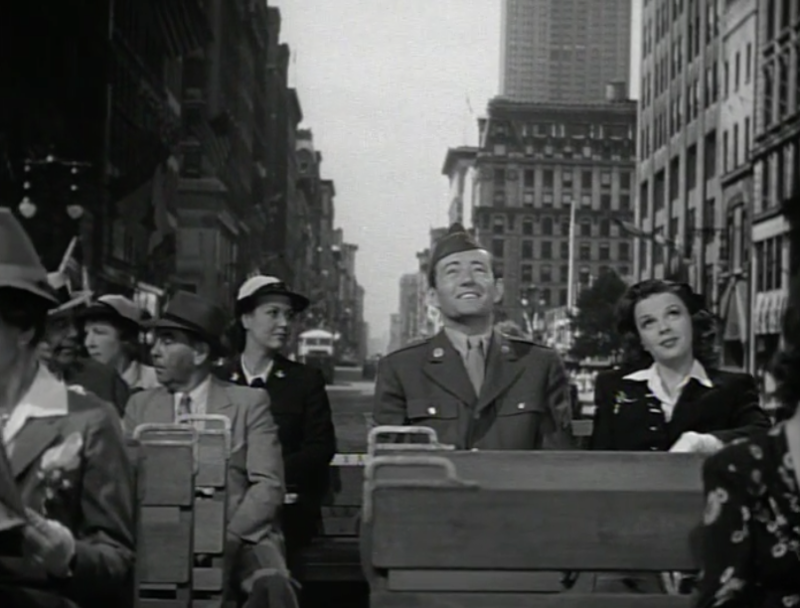 The clarity is amazing (except, of course, in the majority of “Judy Sings Songs From the Movies”). I realize this isn’t a discussion board, but I had to reply. From everything I’ve researched, old video tapes cannot be upgraded to “Blu Ray” or “HD.” Only film negatives, or the current digital way of filmmaking. I don’t think the images could possibly look better than they do now. But who’s complaining? When I first saw THESE images in 1999, I was shocked. Such clarity!! Thanks for writing! I encourage people to comment as discussions are always welcome. 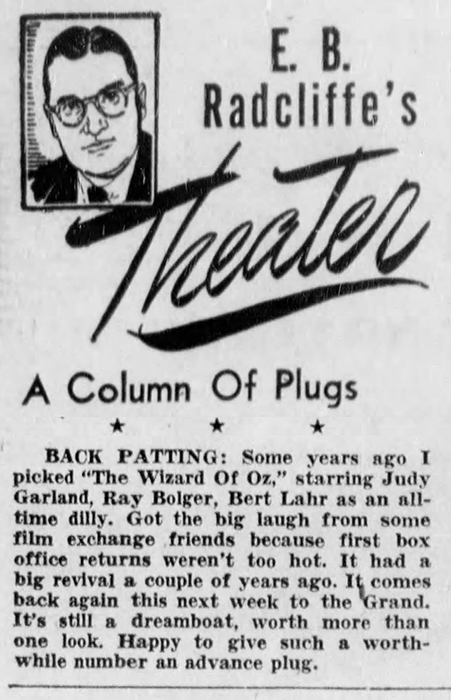 That’s a great point about the videotape for The Judy Garland Show. And they do look so great as they are on DVD right now. I think they’d look even better in Blu-ray even if they’re not true HD by today’s standards. It’s been so long that at this point I think they would introduce her show to a whole new generation.